Tornadoes in MO/KS & Dancing Cows! Good morning and thanks for reading the FOX 4 Weather Blog. Another warm morning out there as a combination of clouds and south winds have kept temperatures from falling off that much overnight. Another warm day is expected. I’ll let KR/MT deal with the rain/storm chances for the next few days as I really don’t have much to add that I didn’t write about yesterday. I thought the subject of the blog today would deal with some new research that came out recently by the NWS. They put together a report detailing tornado climatology and how it related to the states etc. I thought this AM I’d pick out some of the highlights for you. Now before we go any farther, remember this DOES NOT include the data from the 2011 season, which no doubt would boost some of the SE part of the country numbers by a bit. 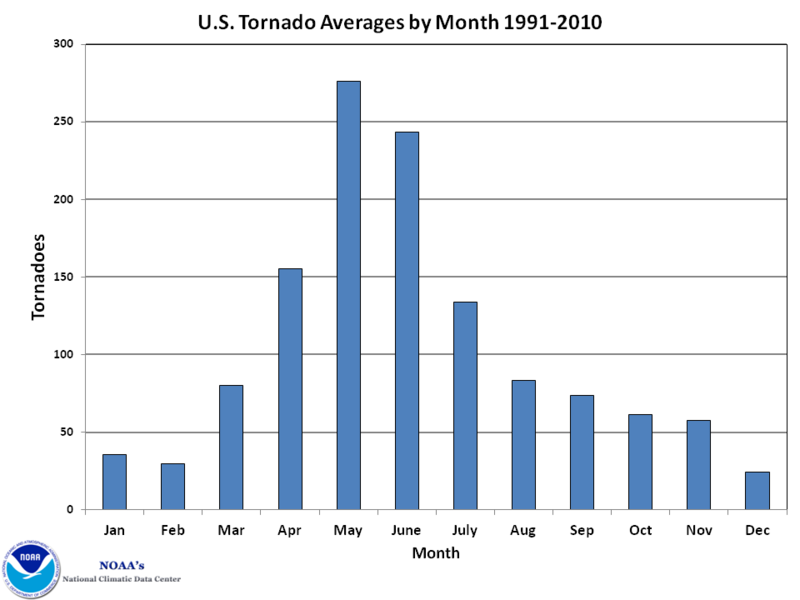 So May, not surprisingly, is the most active months for tornadoes for both states. Also interesting to note that the “2nd severe season” (September thru November) sees only 7 tornadoes for Kansas and 6 for Missouri…not really much of a season actually. actually MO sees 5 tornadoes in DEC-JAN as opposed to 0 for Kansas. Likely because of an improved moisture source as storms move across the Midwest. So Kansas sees more than double the number of tornadoes that MO sees…96 to 45 on overage. So that is a look at some state numbers for you. What about national numbers? Well, the United States leads the world when it comes to tornadoes annually with over 1,200 on average. No. 2 is Canada with about 100. Concerning the strength of the tornadoes, as we’ve talked about many times before, MOST tornadoes are relatively weak. Seventy-seven percent of them have winds under 110 MPH. Don’t get me wrong, the higher end of that number can still do some decent damage, but most well-built homes will survive in that scenario. Ninety-five percent of tornadoes are rated below EF3 status, meaning that 95 percent of tornadoes have winds below 135 MPH. 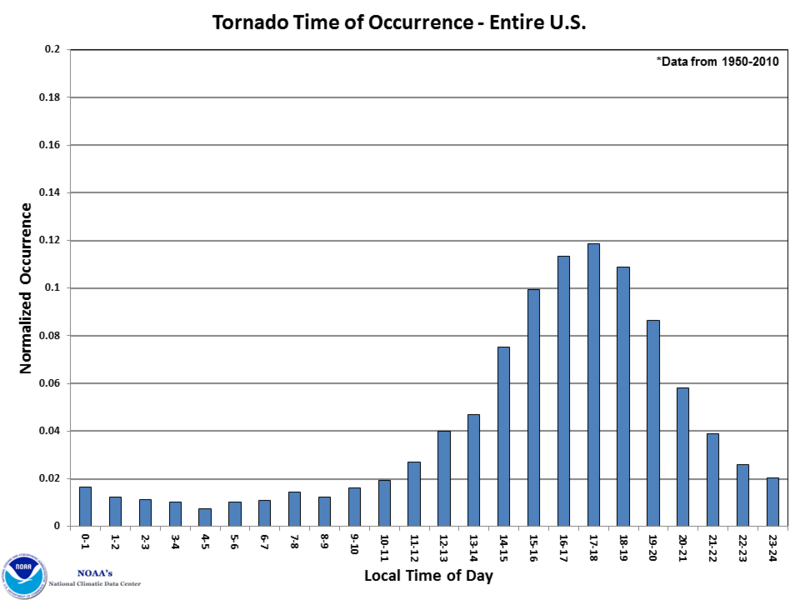 Last year aside, it is still statistically rare for the dreaded EF5 tornado to happen. Only .1 percent of tornadoes are given that designation. Now when do tornadoes occur. again based on this study, most occur after 4PM (nothing really new there). Here is a graphic explaining the peak times. Zero would be 12AM…6 would be 6AM…12 would be Noon…18 would be 6PM. The main times seem to be between 3-8PM or so. Now which month is still the leader in tornado touchdowns…IF you guessed May you are correct. May is #1 and June is #2, followed by April then July. Once again though Kansas does lead the country in a statistic that it probably wants no part of. IF there is a large EF3 tornado or higher…odds favor it to be in the state of Kansas. There is a wealth of other information available to you IF you’re interested. Here is the link to the report. If you are interested in tornadoes and want to learn more it’s a great resource for you. OK, as Monty Python would say…and now for something completely different! Recently in England a bunch of cows were released from their winter holding pens into the great outdoors…and let’s just say they were happy! Joe’s Weather World: How long has it been since you were under a tornado warning?